One of my favorite perks of being in our new house is that we can entertain again. It’s been a long, lonely summer with less cookouts and less camping. Last night we had friends over and one of our guests is vegetarian. I wanted to make sure and offer a dish that would be a “main dish” type instead of just offering salads, etc. I’d made this gratin in the past but I’d honestly forgotten about it for a while. It turned out beautifully and even the non-veggie lovers in my family (ahem…Dewey) tried it and liked it. Definitely use the freshest vegetables you can get your hands on. Hothouse tomatoes from the corner grocery stored will not cut it…trust me. Also, if you happen to make homemade mac & cheese, mix it together with this. I know it sounds weird but it is heavenly! This vegetarian casserole features the best veggies of the summer. 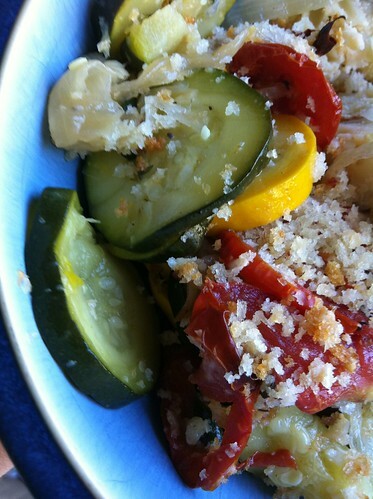 Toss zucchini & squash slices in a large bowl with 1 tsp salt. Transfer to a colander and let drain for at least 45 minutes. Place tomato slices on a tray with a triple thick layer of paper towels. Sprinkle with 1/2 tsp salt. Let sit for at least 30 minutes. Then use more paper towelling to press the tomatoes firmly to remove as much liquid as possible (they will look quite sad after this process but it's OK). Preheat oven to 400 degrees and prep a 2 quart casserole dish by brushing with olive oil or spraying with cooking spray. Set aside. Heat 1 Tbsp olive oil in a large non-stick skillet. Add onions, 1/2 tsp salt and 1/4 tsp pepper. Cook slowly over medium heat until onions are caramelized and medium brown (about 20 minutes). Combine garlic, 3 Tbsp olive oil, thyme leaves and 1/2 tsp pepper in a small bowl. Toss squash & zucchini slices in a large bowl with half of the oil mixture. Layer the squash in the bottom of the prepped casserole. I like to layer yellow squash, then green and alternate. Layer all your squash. Spread caramelized onions evenly across squash layers. Layer tomatoes on top of onions overlapping slightly. Drizzle remaining oil mixture over the tomatoes. Bake for 45 minutes or until tomatoes are starting to brown. Meanwhile, mix panko crumbs, parmesan and 1 Tbsp olive oil together. Once you remove the casserole from the oven, sprinkle the panko mixture on top and put back in the oven for 5 -10 minutes or until browned. Let stand for 5 - 10 minutes before serving. Since I made this for company, I extended the prep over many hours. I let the tomatoes, squash and zucchini drain for much longer than required. It worked out fine....actually it may have made it even better. The veggies in my gratin did not break down into mush. They were still firm (but cooked) and tasted amazing! This definitely looks yummy! And very summery too! Looks like a delicious use of summer vegetables!